Although many of the early settlers were Catholic, others were Protestant. With eventual construction of churches being primarily those of the Catholic faith, however, Catholicism eventually became the predominant religion practiced by residents. Father Lanigan wrote in 1929, "These good people were friends and neighbours ...... and were always ready to assist in times of need or sorrow. When there was a boat to be pulled out of the water, a building to be erected, or any activity requiring help, all worked together as members of a community." The Catholic presence included the St. Thomas' Mission in Upper Prospect, St. Christopher's Mission in Hatchet Lake, St. Joseph's Mission in Shad Bay, and Star of the Sea in Terence Bay-Lower Prospect. When Terence Bay became a separate parish from Prospect, Reverend Gerald Mabey erected a beautiful grotto in honour of Our Blessed Lady, Stella Maris. Reverend Father O'Sullivan visiting from New York donated the statue of Our Lady in remembrance of his mother, Margaret O'Sullivan. A ceremony referred to as the Maple Session by Bernadine MacMillan of Prospect was a Catholic rite involving young boys and girls. The girls wearing white dresses and veils, carried baskets of flowers while boys carried flags, some yellow and some red. Then, there was a service where someone carried a crown made of flowers for Lady Mary's head and another would crown her. Hymns were sung afterwards. An annual ceremony was called "The Blessing of the Boats." Anglican churches are St. James' in West Dover and St. Paul's in Terence Bay, the St. James United Church is in Goodwood and there is the New Life Baptist Church in Bayside on Prospect Road. One Upper Prospect resident involved for over 20 years on a daily basis with his church was Billy Smith, one of the village's fishermen. Even when he retired from fishing in 1935, he still worked mending nets for others in his fish shop. He is remembered for ringing the bell for "Angelus" every day. He was born in Upper Prospect in 1859. He played the piccolo to entertain his friends. In its work in the communities, the records of the Catholic churches show how involved the church was as a center of life, providing not only religious services and rites, but also social opportunities such as picnics and education. Many of the Sisters of Charity and ministers taught the children in school. And for adults, meetings were arranged with different provincial government representatives on the topics of marketing, the cooperative movement and credit unions. One priest, Father Sweeney, initiated a sports fishing industry in Upper Prospect in the mid 1960s. Waterfront property was leased and the Prospect Salt Water Sport Fishing Co-op founded. There were about six vessels owned and operated by the local fishermen who engaged in the venture. 1784	First Catholic church is built in Halifax, St. Peter's serving the communities from Halifax down to Upper Prospect. 1787	Rev. Charles Inglis became the first Anglican Bishop of Nova Scotia. 1790	Rev. Thomas Grace from Ireland spent time at Upper Prospect. 1794	Records show Father Jones and Father Power from Ireland visited Upper Prospect and a Catholic church was built at Upper Prospect, an achievement attributed to Rev. James Jones who then had charge of the missions in Nova Scotia. 1800s Church and school were closely aligned with religion being taught along with reading, writing and arithmetic. Many ministers or nuns taught in the communities. Religion pulled the communities together. For many years the parish priests of Prospect would travel through communities as far west as the Dovers in all kinds of weather on foot, by canoe or on horseback to provide services. 1814 Rev. Joseph Crandall began Baptist activity in the communities. 1841	Roman Catholic Total Abstinence Association founded by Father Kennedy in Upper Prospect. 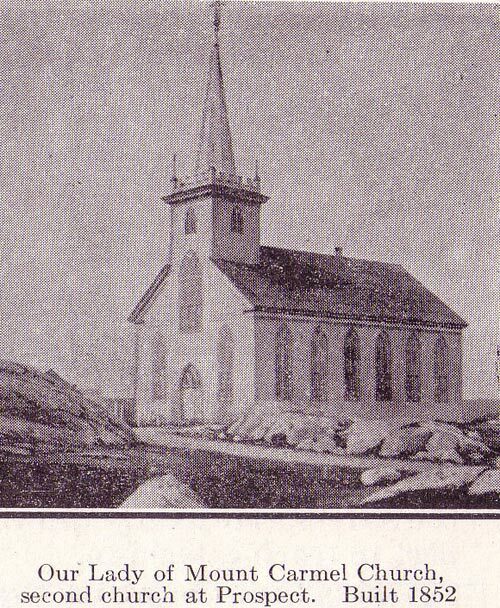 1842	The church known as "The Church Built in a Day" was the Catholic church in Halifax in the south end. More than 200 Irish parishioners banded together to erect a house of worship. Before the day was over the building was "raised, roofed, lathed, covered in, floored, and a great part of the outside shingled." 1845	Bishop Walsh of Halifax made an official visit to Upper Prospect. 1846	It was decided to built a new church in Upper Prospect. A meeting was held and it was resolved that "as our present church is inadequate for our present congregation, we deem it expedient to endeavour to erect a new one, suitable to our increasing numbers." The frame and boards for the new church were procured at Mahone Bay; and the frame, having been cut and partly assembled, was shipped to Upper Prospect by boat. 1849	St. Peter's Catholic Church built in Lower Prospect. 1852	Rev. William Walsh blessed Our Lady of Mt. Carmel Church in Upper Prospect, built to seat 500 people. 1888	First Baptist Church, St. Thomas' Church built in East Dover. 1876	Three Sisters of Charity (Mary Jerome Grimmen, Mary Cornelia Tynan and Mary Philippa Melanson) came from Upper Prospect to establish `	and help out with education in Lower Prospect and Terence Bay. Many Sisters in the Order followed. A nunnery and small chapel which also served as a school were built. According to local folklore, a conch shell was sounded each day at noon when everyone would stop to say their "Angelus", five minutes of silent prayer. 1895	Rev. Parker gave his first mass at St. Peter's Church. 1906	The Sisters of Charity left Upper Prospect. 1915	St. Joseph's Catholic Church built in Shad Bay. 1921	Our Lady of Mount Carmel in Upper Prospect burns and is rebuilt in 1922. Nothing was saved. The population of the community was on the downgrade from previously flourishing times. 1922	A meeting in Terence Bay decides to build a new and larger church. 1923	St. Peter's Church was nearing completion when it blew down in a strong wind and was carried off its foundation, tower and all, landing on its side. It was so completely destroyed that no attempt was made to raise the shattered structure for some time. 1924	A picnic is held to raise money to build a new rectory in Upper Prospect and the building was completed by the end of November costing about $2,500. 1925	Stella Maris Church built in Terence Bay replacing Saint Peter's. First mass held Nov. 21st and first picnic took place on July 1st the same year, raising $150. The first baby baptized was Wilfred Pittipas, son of Della and William Pittipas on Nov. 22. First wedding was a double wedding. Marrying were William Umlah to Evelyn Little and Demerus Slaunwhite to Mary Pittipas on Nov. 25. 1926	Mount Carmel Hall built at a cost of $2,000. It was decided to install electricity in the church, rectory and hall in Upper Prospect. 1927	St. Thomas' Catholic Church at East Dover was struck by lightning causing considerable damage. 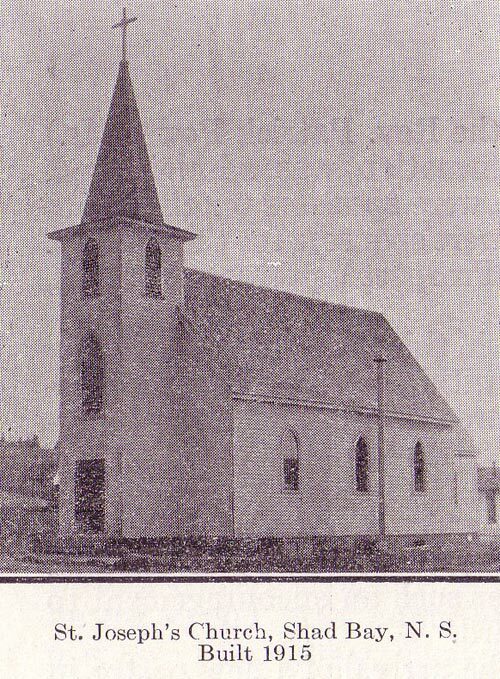 1928	Renovations were made to the St. Joseph's Catholic Church in Shad Bay. Residents held a picnic and social events to raise the money for them. 1930	Nuns are invited to come back to Upper Prospect. 1931	Sisters M. Beatrix, Marie Edwina and M. Jovita reopen the Sisters of Charity Mission in Upper Prospect and a convent was built there. 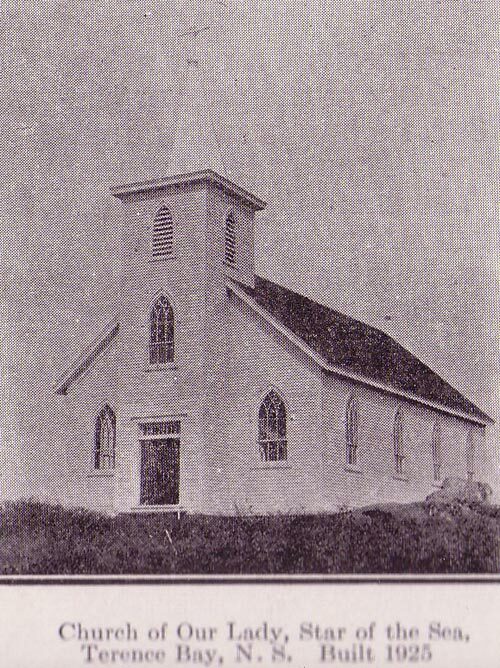 1932	It was agreed by the Catholic parishioners of Shad Bay to build a larger church. 1938	Star of the Sea Convent is erected for the Sisters of Charity in Terence Bay. Sisters Margaret Patrice and Elizabeth Clare start the crafts school in Terence Bay community. Community hall is also built. The parishioners of East Dover decided to renovate their Catholic church. 1939	St. Joseph's Catholic Church erected in Shad Bay. 1942	Lightning struck St. Paul's Church of England in Terence Bay. Flo Harrison remembers the old church that burned down when she was only 7 years old, "It was beautiful made of wood with a balcony." In those days she says everyone looked forward to going to church on Sundays and dressing up. 1943	Terence Bay Community Hall destroyed by fire. 1944	150th anniversary of the Prospect Parish celebrated in Upper Prospect where a number of arches covered with evergreens and flowers were positioned along the road for half a mile leading to the church. 1945	St. Paul's Church of England rebuilt. 1947	Catholic Church Hall opened in East Dover. 1950	Last person to be laid to rest in St. Paul's Anglican Cemetery in Terence Bay was Cecil Slaunwhite and the first person laid in No. 2 cemetery was Ellison Slaunwhite, July 29. 1959	St. Joseph's Church in Shad Bay was relocated from the lower section of the community to the top of the hill. 1960	The rectory in Upper Prospect which had housed the priests since 1924 and the convent built in 1931 were declared surplus and sold as private residences. The Paraish moved its center of activity to Shad Bay. 1963	St. Thomas' Church in East Dover celebrated the 75th anniversary of its founding. 1964	Last 2 people to be buried in Star of the Sea Cemetery in Terence Bay (No. 1) was Alvin J. Slaunwhite and Ella Slaunwhite on May 12. First person to be put in new No. 2 cemetery was Mrs. Leon Little (Adelaide) on May 23.